Toast the bread and spread each piece with 1/2 tablespoon butter. In a small bowl mix the sugar and cinnamon. Sprinkle over the bread. You may not need to use all of it. Place 2 banana slices in the upper corners of each piece of bread for the ears and one on each piece of bread in the middle for the nose. Place 2 raisins for eyes and one for a nose on each piece of bread. Summer's here -- no more boring school lunches. Turn your backyard into a Teddy Bear Picnic with these great sandwiches and snacks. “I’m bored!” How many times have you heard your kids mutter that phrase now that school is out? It’s time to flex your creative muscle and brainstorm some ideas to keep both you and your kids safe from the disease called boredom. I’ve got a fun activity that they'll love. With these adorable Teddy Bear Sandwiches, you can create your own Teddy Bear Picnic in the comfort of your own backyard. 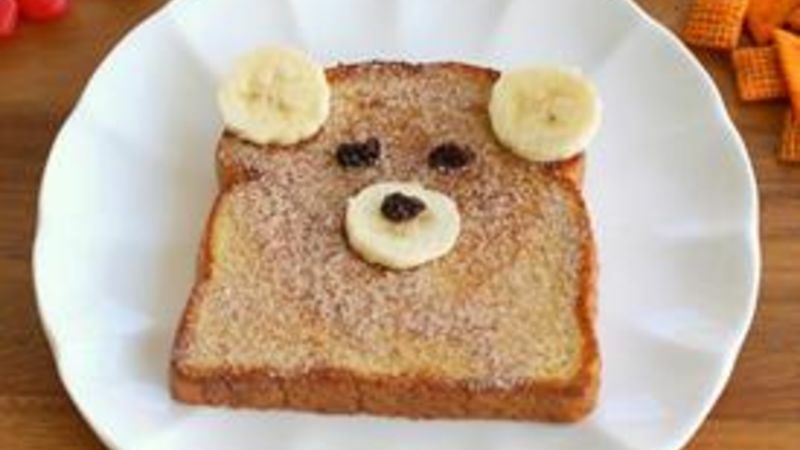 All you need is some bread with some strategically placed bananas and raisins to turn a normal sandwich into your very own edible Teddy Bear Sandwiches. I sprinkled some cinnamon sugar on my bread but you could top a regular peanut butter and jelly sandwich with the bananas and raisins too. I told my kids to grab their favorite teddy bear and to meet me in the backyard for our Teddy Bear Picnic. They were thrilled to see a blanket set out and plates with the Teddy Bear Sandwiches! No picnic is complete without plenty of snacks, so we had some Chex Mix along with their choice of either Gushers or Fruit by the Foot. My kids loved feeding their bears snacks and letting them taste their sandwiches. I love a clean house but sometimes the chores need to wait and we need to take time to make some backyard memories with our kids! More Kid Fun Check out these cute and fun recipes that the kiddos will love!